Capable Workplace Learning is about Capable people, Capable Organisations and an underlying belief in the applicability of the concept of Capability to Work, Place and Learning. 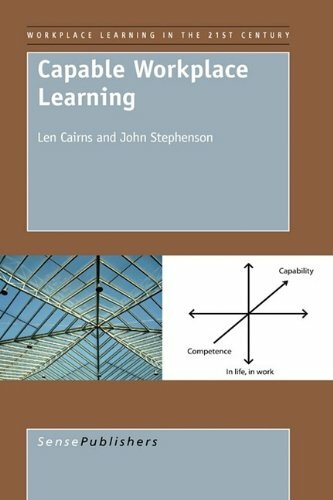 In this book, Cairns and Stephenson present a case for the development of human Capability, in life, in work, and in the lifespace. They trace the development of the Capability concept arguing that it embraces and goes beyond competence. They draw on over 35 years of experience of direct involvement in enhancing adult Capability through education at all levels. Capability, they also argue, applies as much to organisations and working practices as it does to the individuals involved and call for synergy between organisational and personal capability. Further, the book presents a case that learning through work, whereby people utilise their work experiences and activities as the opportunity, process, place and content of what they are learning whilst they are "working" has, they suggest, established itself as a creditable way of looking at the knowledge development we all encounter and engage with whilst working. The authors explore a range of examples of Capable practice in business and higher education and present a number of portraits of individuals whose lifework, personifies the Capability at work concept. In addition, they suggest, governments should go beyond the rather narrow aspiration of raising skills levels, to encouraging more people to experience formulating and solving the problem of their own development.